Today I'm covering beauty, a topic that I don't discuss often on Coco, but when I was approached by my lovely work colleague Nicky to sample some Forever Living products for review, I was dying to see what she had in store. Forever Living is a company that I knew very little about, so I decided to do a little research before I tried out the goodies. All FL products contain Aloe. There are over 400 species of Aloe in the world, but it's Aloe Barbadensis Miller (to give it its Sunday name) that FL are interested in. Known for it's soothing qualities, 'Forever Living' cultivate ABM in plantations in both the Dominican Republic and Texas to create the best form of Aloe Vera to use in their amazing products (if you want to read more about their Aloe story, you can do so here). The massive box of goodies I was given to play with! I'm not normally one for pampering myself, but because I had so many goodies to try I decided to take the time to use them properly and spread them out over a couple of days. I started out easy and went with the eye make-up remover, hand and face soap and the moisturiser. The eye make-up remover was lovely. It was really soothing around the eyes and didn't cause any stinging. I have quite sensitive eyes and skin, so I was pleasantly surprised with how kind this product was to my face. The moisturiser sample I had was also pretty amazing; the products are all very rich and high in quality, so I found that whatever I was using went a long way, less is definitely more! My favourite of these three (and probably my favourite product of all), was the hand and face soap. It smells absolutely unbelievable; think of the best smelling baby soap your mind can muster and you still won't even come close to the scent of this little beauty! One pump's worth was enough to wash my hands and face, so if you were buying this product you certainly wouldn't have to repurchase it very often. A single pump's worth of hand/face soap went a very long way! After that little mini beauty regime, my skin went to bed happy and woke up feeling just as nice; no irritation from these products! During my morning shower, I decided to try out the samples of Shampoo and Conditioner. My scalp is usually where I suffer most with my sensitive skin; I regularly have to change shampoo as my scalp is easily irritated, so I was a little sceptical about how these products would affect me. Again, both products are quite rich; there was more than enough in each little sachet to cover my short hair and I'm also pleased to report that I didn't suffer from any irritation after using them-success!! 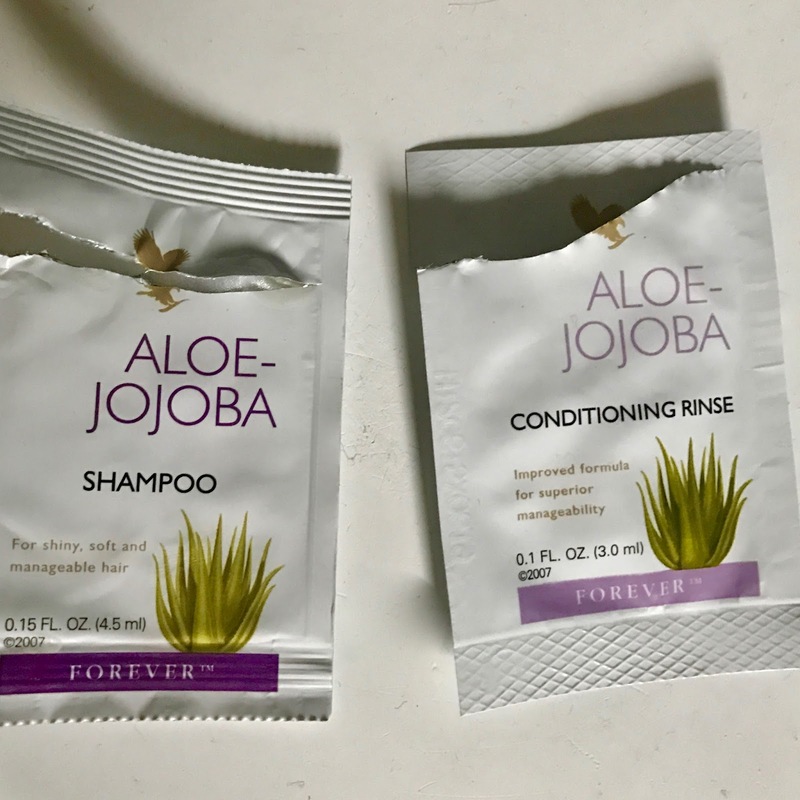 If I was buying any Forever Living products, these would probably be the ones I would choose; my hair felt lovely and soft after using them and it's rare that I find a shampoo which leaves me itch free-I'd definitely recommend it for all those with sensitive scalps! The final products I tested from Nicky's Forever Living box of goodies, were the Aloe Activator and Mask Powder. A teaspoon of each product mixed together and applied to the face with an old make-up brush, creates a powerful tightening face mask dubbed 'Botox in a box'. 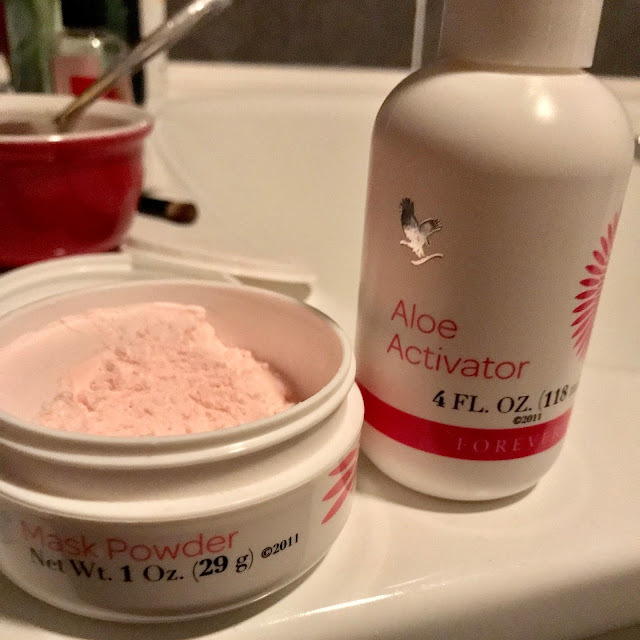 I don't often use face masks, so I decided on my second night of pampering to give this one a whirl! ...I looked like a burns victim and I couldn't even move my mouth to smile!!! 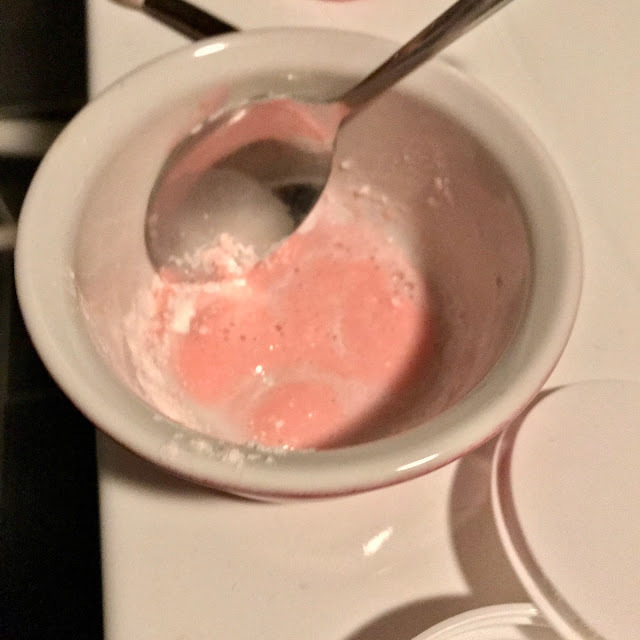 It was quite possibly the weirdest sensation I've ever had on my face; but thankfully after the thirty minutes, and with a little help from the hand and face soap, the mask removed easily and I could move my face again! After removal, my skin was quite red and blotchy, which Nicky explained is part of the tightening process; the mask stimulates the blood vessels under your skin which causes the redness. I followed, as advised, with the Aloe Nourishing Serum (£34.69 for 118ml) which was delectable on the skin and helped to cool my face down. My skin felt amazing afterwards! ...and my face soon returned to normal! I was really very impressed with the range of products offered by Forever Living, and the quality of each in turn. My favourite product was definitely the Hand and Face Soap, but I didn't really have any major complaints about anything that I tried; I was pleasantly surprised with everything. The products in the range are quite pricey, but I found that with each one I tried I only needed to use a very minimal amount, so when you consider cost per use, they are very good value for money. Forever Living isn't available in the shops, but if you are interested in purchasing any of the products or trying out some samples for yourself, you can contact Nicky by visiting her website here. Thanks Nicky for letting me have a play in Forever Living land! I was given these products for reviewing purposes but all opinions are my own.